Enhance your billing processes and increase cash flow with ABILITY UBWATCH. 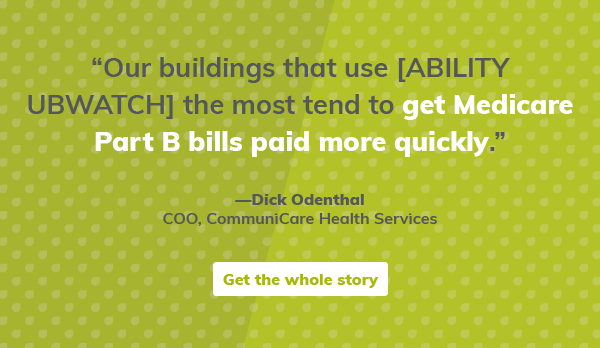 By detecting and revealing unintended billing patterns, ABILITY UBWATCH helps you avoid suspended claims, CMS audits, demand for repayments, False Claim Act issues, under/over billing, and other missed opportunities that may result in lower revenue. Using a system of logic designed specifically for Universal Bills claims, ABILITY UBWATCH methodically reviews each UB prior to submission and alerts you to any inconsistencies or potential compliance issues which may delay payment or decrease revenue. ABILITY UBWATCH helps coordinate financial UB records, tracks patterns and trends, and makes sure you’re being reimbursed for the services provided. Ensure consistency between your MDS and claims by adding ABILITY UBWATCH to your ABILITY CAREWATCH® service. Find unintended billing patterns before claims are submitted. Coordinate clinical MDS and financial UB records and identify ways to resolve clinical and billing discrepancies before submitting a claim. Reduce the manual effort required to support an effective “triple-check” process. Find untapped, justifiable revenues using the RUG Potential tool. View your RUG groups before transmitting your assessments and plan ahead for the next MDS. You’ll optimize resident care and proper reimbursement for your services and care. Get alerts about billing that is unsupported by the underlying MDS. UBWATCH brings exceptions to your attention and allows corrections to be made prior to submitting claims, minimizing delays and revenue reductions.